In a completely new take on showcasing a collection, Ralph Lauren has created an online, shoppable storybook video, narrated by Uma Thurman. 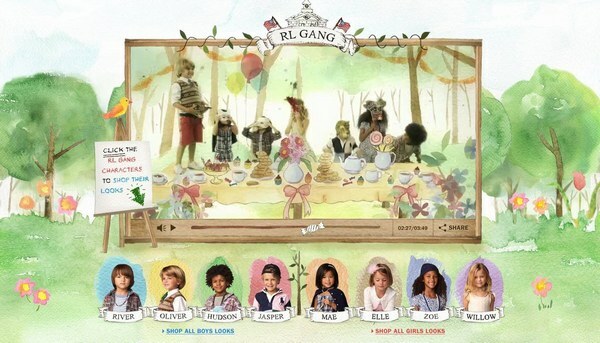 The story, The RL Gang: a Magically Magnificent School Adventure features a group of characters who parade a number of Spring 2011 outfits – all oozing that button-downed collar, pintucked preppiness synonymous with American style. Like what you see? Simply click on the outfit and it takes you straight to the online store – bet you haven’t shopped via storybook before?! I suspect this story is written for mummies and daddies who spot their own child in little ‘Willow’, ‘Mae’, ‘Hudson’ or ‘Oliver’ and need the outfit to go with it. But there is a hardcover copy of the story available if you are keen to make the RL Gang part of the bedtime story routine. Check out the story below but if you want to watch and click to shop, head to the Ralph Lauren website.